At Century High School in North Dakota last week, plenty of fans were in attendance to watch their schools’ basketball teams go at it. One man, who is 5’8 240 pounds, named Sherwin Shayegan, decided to get a little more into the game. He showed up in a full uniform of the visiting team, acted like he was handicapped, and got water for the team. He even began to give the players back massages. After the game was over, Sherwin went out to celebrate with the team and asked for a piggyback ride. One player actually gave him one! In fact, this is not his first rodeo (no pun intended). He is known as the “Piggyback Bandit”. His piggyback rides can be traced back to 2008 and have happened in Washington, Oregon, Montana, North Dakota, and Minnesota. How has he not gotten in trouble yet? He has even tried to pay for piggyback rides too. He gets close to them by playing it off like he has an illness, writing term papers, acting team manager, and even just used the crowd to blend in as an every day fan. 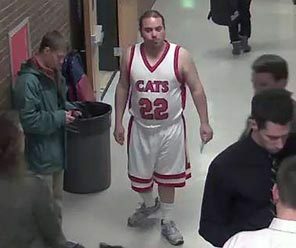 This entry was posted in Everything Else and tagged bandit, basketball, boston sports blog, creepy, funny, High School, piggyback, sherwin by christoph131. Bookmark the permalink.